Wherein lies the transformative power of this work? We aim to create which mirror the universal forces in their perfection. As we do so, their effect is mirrored on people and they can be transformed, as they reconnect to the innate abilities of their being. Such spaces become repositories of the knowledge of the Gods. Connecting to this knowledge allows us to be freed from the illusions of the world of matter. We find higher levels of consciousness and awareness which become part of our skillset, and as a result, our day-to-day lives improve and we live more fully, purposely and happily. At its rawest form, the work of sacred spaces is about fascination with the human soul. Many ancient civilisations believed in immortality, long before Socrates later proved the existence of the soul as being separate to the physical body. They believed that the physical body was only one part of our being and each existence, or incarnation, only a stage in our development. It is about venturing past the accepted and the “understood”, and seeking the truth, despite the difficult journey.It is a form of shamanism, bridging us to the other world. Everything that happens on the material plane is a reflection of recurring actions taking place on the celestial sphere, where it originates. This work is about creating the necessary connections to allow for us to live in our ultimate potential by connecting to the fabric of the universe. The fabric of the universe is unconditional love, therefore connecting to the universe connects us to the unconditional love which is the highest force behind transformation and creativity. At the deepest level, it is about connecting to the great Oneness ; that great expanded force which is behind everything, the force that grows the plants and trees, and the same one that moves our fingers and toes. When we connect to this oneness and force, we begin to live in the flow of life where we find peace, purpose and the right things begin to manifest effortlessly. Through this process, our soul reconnects to the infinite knowledge which it has access to, but has been disconnected from. This newly activated being, or physical body, now begins to affect the physical world around it, our life beings to change. With this form of enabled connection, our space impacts us, but we also impact it, it will then impact others who come in contact with it. A network of sacred spaces works like a sort of acupuncture for the earth, working together towards collective growth, transformation and healing. The earth is a living continuum which we are part of. The Earth is a little over 4.5 billion years old, its oldest materials being 4.3 billion-year-old zircon crystals. Its earliest times were geologically violent, and it suffered constant bombardment from meteorites. When this ended, the Earth cooled and its surface solidified to a crust - the first solid rocks. There were no continents as yet, just a global ocean peppered with small islands. Erosion, sedimentation and volcanic activity - possibly assisted by more meteor impacts - eventually created small proto-continents which grew until they reached roughly their current size 2.5 billion years ago. The continents have since repeatedly collided and been torn apart, so maps of Earth in the distant past are quite different to today's. The history of life on Earth began about 3.8 billion years ago, initially with single-celled prokaryotic cells, such as bacteria. Multicellular life evolved over a billion years later and it's only in the last 570 million years that the kind of life forms we are familiar with began to evolve, starting with arthropods, followed by fish 530 million years ago (Ma), land plants 475Ma and forests 385Ma. Mammals didn't evolve until 200Ma and our own species, Homo sapiens, only 200,000 years ago. So humans have been around for a mere 0.004% of the Earth's history. From Ancient Nature-made mounds, to modern day temples. This is where sacred spaces began: the perfection of the universe created mounds and hills which represented stronger energy points for human beings and other life forms would find the deepest connection it was looking for. Thousands of years later, the very principles that began as natural mounds have found their way towards becoming sets of principles to create sacred spaces we can interact with on a daily basis. It is believed in esoteric circles that the first souls began to incarnate on earth 100000 years ago.These first beings that came onto earth were highly advanced divine beings as they arrived directly from a very strong connection to source. As time went on, they began to forget their divinity. 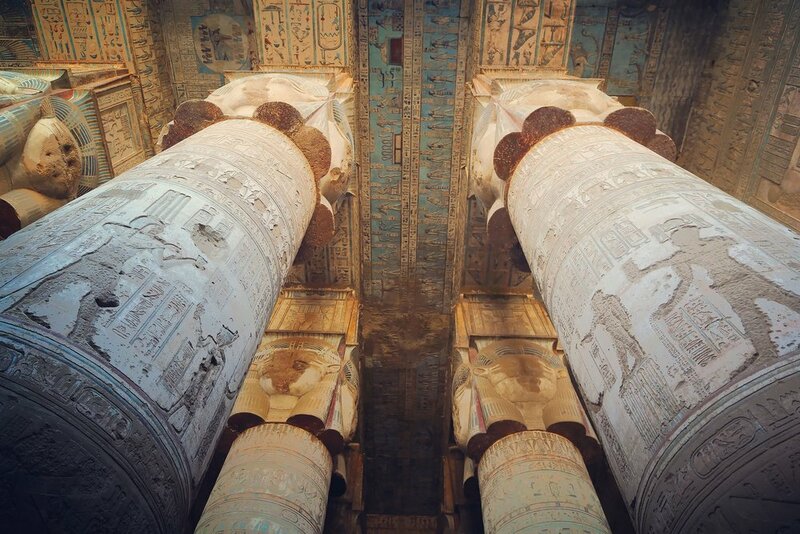 The ancient temples, which currently still exist around us, are the means through which ancient cultures reconnected to that power and thus maintained themselves in balance for thousands of years. It was a way for these divine beings to maintain their connection to divinity. Temples are sacred sites which were built by our ancestors for the development and growth of mankind. Many of these are still standing today, including places like the great pyramids of Giza, the mayan sites of Mexico, the monuments in Greece (temple of Delphi, the Acropolis) and even simple rock formations like Stonehenge. Whilst we are led to believe that temples are mainly shrines standing in tribute to old kings and old civilisations, they are actually also living organisms which amplify the human potential. They served as ancient Academies of the spirits, monuments to the tree of knowledge, one which, if we eat from it, will bring us enlightenment. As time advanced, humanity which existed began to lose its connection to the divine. mankind became disconnected from the primal source we once felt so comfortable with and which serves as an umbilical chord with the worlds we can not see or touch . They would meditate and be followed by shamans for years and then when they were ready, they would spend time in the temple to receive the knowledge they needed. They were to find the wise person within, asking questions they needed to ask, and the temples would speak and answer. They held ceremonies which involved ingestion of herbs, similar to the idea of Ayahuasca but without any of the side effects. After this experience, the initiate would go back to their life, and live with a new found sense of equilibrium in which nothing can affect us anymore. The oldest recorded Temple or sacred site which exists on Earth is 17,000 years old, the temple of Tiwanaku in Bolivia. This would indicate that the whole temple culture would have emerged around that time, however, there may be some earlier temples which have still not been found, or which have disappeared without a trace. You may have heard of the story of Atlantis, the lost continent. In the story of Atlantis, it is said that the civilisation of the time was a utopia. And the continent fell when people began to lose their sense of gratitude. They became entitled, greedy and disconnected from their divine nature. The fall of Atlantis would come as a way to rebuild human consciousness by re-enabling a new connection to the divine. Whilst there is a lot of controversy about whether or not Atlantis really existed, there are some scientific elements of the story which have been proven by geologists and scientists over time. They were said to be tall people of about 4 or 5 meters tall with characteristics which resembled those of Super men. Many researches and writings reported finding proof of the existence of people of this type. According to studies by Danish Scientist there would have been a major catastrophe in 9703 BC which would have changed the course of the Earth’s history. A comet would have split into 7 parts and collided with the Earth in 7 places. For months, it was Armageddon. Floods and storms caused unimaginable chaos which destroyed most of the civilisations which existed at the time. The sea levels were raised by 50 meters, and many civilisations were entirely wiped away. Some survivors were lead to the tops of mountains, where they would be able to survive. They became the builders gods who were tasked with rebuilding the communities, starting with building the temples, the mansions of the Gods. As it was a time of chaos, and the temples gave people means to return to their centeredness, these were the top priority to be rebuilt. These would be the academies for people to remember their godliness and find balance once again. Therefore, the temples were built as mirrors of the heavens so men and women would remember this connection which was slipping away; they would be transformed into divine beings. Temples behave like stone needles performing acupuncture throughout the surface of the earth.They are Power places that help enlighten the individual and where the greater good of the community is served and centres for connection with the divine spirit. They are also repositories of the knowledge of the gods, where imbibing that knowledge empowers the individual to be free from the illusions of the world of matter. Under these conditions a person is able to live fully aware, we begin to remember our deepest intelligence as a celestial being. As they began to build many of these, they began to work not only as individual “centers of divinity” but also as a network, a sort of chain of self-help centers in the face of Chaos. Under the influence of these sites, we would enter and leave as a whole being, somewhat more “holy”. They were places that would awaken our highest consciousness, raise our vibration, raise our level of resonance and connectivity to the outside world, raise our awareness. They are microcosms of the macrocosm, mirroring our own excellence, mirroring the perfection of the universe and when we align with these “perfect” spaces, we can find perfection in ourselves. The order of the surroundings would have a profound effect on our beings. The transformation of an ordinary being into an extraordinary human. They become examples to others, therefore helping raise the levels of awareness of others and maintaining societies in balance. They facilitate enlightenment and bring the potential of paradise ever closer to the individual and communal body. Temples were about initiation to the process of resurrection. In these spaces, people would undergo a death experience which allowed them to draw in some information and knowledge from the universe which would bring into their day to day life, and then could then be strengthened and become manifestors ad creators, finding empowerment. Probably the most famous story of resurrection told in Christianity is that of Jesus Christ. The church speaks of resurrection as the end, when in fact, resurrection is about having a near death experience where we will die and come back having drawn in new information and knowledge from the universe which we would bring into our daily life to be strengthened as manifestors and empowered. They are microcosms of the macrocosm , built according to universal laws. Hundreds of years of analysis of sacred sites reveals knowledge of advanced geometry, the mathematics of the earth’s processional cycles, solar, lunar and stellar alignments. They were designed with the purpose of mirroring images of the essence of a greater God, and by implication, the order of the Universe. They provide guidance in daily ritual and instruction of proper conduct of human affairs. These same principles were later mirrored in the construction of cathedrals which are tuned resonant cavities. Russian researchers recently found that the combination of stone, place and proportion is capable of stimulating the mind. A measurement of their brainwaves registered an increase of 4000% above waking state, illustrating that the combined resonance of the building elicits an out-of-body state, a shamanic environment that shuts down the logical part of the brain but activates the intuitive. It can be said that one would have a religious experience, in the original meaning of the word religio, which means to respect the sacre. connection to Source. Which brings us to the second point: the building, by deliberate design, literally elevates the soul of the pilgrim who immerses himself within its structure. It was seen as a kind of alchemy, where the individual — compared to a base metal — is transformed into metaphorical gold. The purity of the unadorned sacred space conforms to the anagogical journey from the material (the outside) to the immaterial (the interior), symbolising the inward, spiritual path that leads to self-realisation and the formless realm of God. What connects the Earth's consciousness to the Earth's physical being is a network of telluric currents, energy lines which transports the earth's magnetic energy across its surface. WHen these energy lines meet, they create power spots called Fawn. Their existence has been proven by NASA in 2012 and they become access points where living beings on earth can have access to information and capabilities from the ether space. This is the powerhouse of the sacred space work, truly the most important engine of its success. Buddha himself was famous for speaking of us as energy beings and simply a collection of oscillating atoms which shift with awareness and consciousness. It took hundreds of years for science to catch up, but it was (much later) proven by quantum physicists that we as well as everything around us, are indeed energy. If we are energy, the energy needs to originate from somewhere and circulate for our living organisms to stay alive and healthy. Power spots are known as Fawn. They were spoken about extensively by the Hopi tribes which existed in south America near Easter Island as places where electro-magnetic lines meet telluric currents. The electro-magnetic lines meet the telluric currents, ley lines which cross the earth. At these meeting points are the hot spots. Repeated exposure to hot spots builds up a numinous state of mind in the individual. Influences the mind creativity, elevating personal power and attunes spiritually raises resonance and creates a numinous state of mind, going to hotspots allows us to pray for the people who we want to send healing to. The earth’s energy circulates on a network of telluric lines and ley lines which exists on its surface. These lines originate from its magnetic poles. It was proven in 2012 by NASA that the lines indeed crossed at some points and that, at their crossing, exist strong energy portals where the earth has access to direct energy from the sun and other planets. These portals, reportedly open every 8 minutes. Our ancestors knew this long before and each and every sacred site we know today exists on one of these points. Each and every sacred site is located at the foot of an energy power spot, with an intensity measured by a magnometer. Imagery, symbolism, materials and colours were used to create connections which would be valuable in a person’s growth and development. Materials were chosen for their composition which would amplify the resonance and frequency of the already existing energy power spot. Colors were used to trigger certain energetic effects. Symbols were used to create certain valid associations, even on a subconscious level. The layout and orientation was an important aspect as well. It relied on the forces of nature, the relationship between its elements and certain natural forces which were quite impactful, such as the sun rising to the east, setting to the west. The magnetic lines of energy originating from the north, the equator being located towards the south (for the northern hemisphere). As our beings are mirrors of the earth, our connection to our space relied on our spaces connection to these elements as well. The sacred geometry of the Earth is called the architecture of God. It is the geometric arrangement which exists at the base of the DNA of everything in existence on Earth. By using this sacred geometry in the temples they created, the created spaces which truly replicated the perfection of the universe, allowing to enable the connection to our own perfection as well. It is important to know that when we talk about perfection in sacred spaces, it is not the same type of perfection as in most interior design practises. It is about alignment to the Universal laws. An example of this is how the Pyramids of Giza are the same width and height as the planet earth, but scaled down to a multiple of 72, a sacred number. This means the pyramids were built replicating the exact same measures which were used in the creation of the earth. In Easter island (above) it was believed that the statues moved into the right position using a force called "Manu" a collective intention field created by its "builders". These sites gained more power with time. As people visited them with the intention of growth and development, their power was strengthened. Also, as people were aware of the benefits of visiting them, that prepared them, paving the way for the transformation which was to come. Intention became an important ingredient as well. It is important for us to look at the temple culture as this is where the whole sacred space practise first initiated. The sacred space practise begins as mounds, hills and mountains were naturally formed as places of intense energy where humans could connect to higher energetic frequencies which were available there. 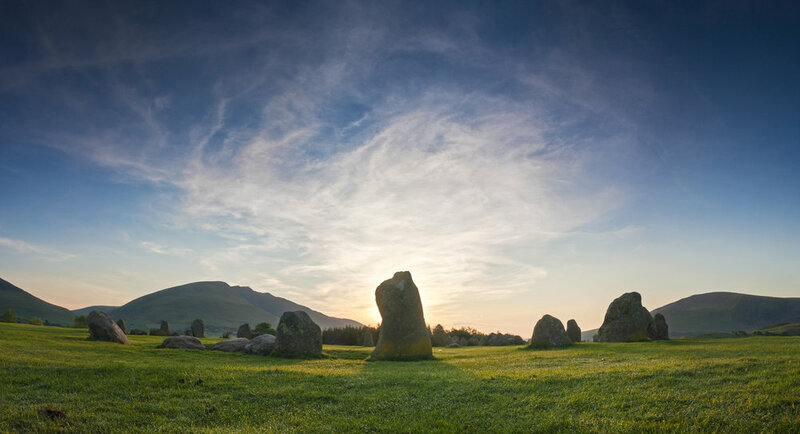 These mounds later lead to the creation of stone circles, like Stonehenge and Castle Rigg (above) the placement of specific types of stones in a specific location, in a certain way would create an amplified, intensified and highly potent energy field. Above is the nature-made mound called Dehenet, next to the valley of the Kings in Egypt, known as being the first mound which inspired the shape of the first pyramids which then became popularly used as a shape in temple making. The oldest temple known to man is Tiwanaku in Bolivia which is 17000 years old. Temples were another way of amplifying and intensifying natural energy fields to create spaces which could enable transformation. The knowledge then expanded from the world of pagan sites to the churches and cathedrals of the middle ages in Europe. 7000 years ago, the practise of Vashtu Shastra was developed in India, from which Feng Shui was later created. these practices carried the knowledge into modern times and today the world of sacred spaces had become a broad, multi-dimensional field of work. As mentioned earlier, the oldest existing constructed temple is Tiwanaku in Bolivia. Long before any constructed temple existed, there were mountains and mounds which were created already existing in nature. These were sacred spaces behaved as natural temples and simply climbing on them would bring us closer to the divine. As they could be seen from further away, they were easier to find, allowing us to remember where the places for divine connection where located. Ancient civilizations began to build buildings first to mark these sacred sites so we can remember were to go to connect to the divine, but then began to create structures, stone circles, temples etc, to amplify and increase the frequency and potency of these sites. It began to be understood that as we are universal beings trapped in a 3D body, we become ill because we are stuck in a place which is out of alignment with our own make up. We become angry, ill, self-harming. Temples mimic the order of the universe so we can find alignment, we can refuel, strengthen our wisdom as these temples are places of universal force on earth. Whilst initiations, pilgrimages and live resurrections were common in temples, practises were later devised to create more systematic approaches to the sacred space field. In Jerusalem, Temple Mount stands on a particular sacred rock where all manner of events associated with spiritual ascension have taken place since the time Solomon has built his temple, a sort of stairway to heaven. The shape of the pyramids of Giza was inspired by an unusual hill called Dehenet by the Nile which was chosen by the pharaohs as the gateway to the other world. It stands over what is known today as the Valley of the Kings. Stonehenge is an evolution of all of this, a simple circular stone alignment, thousands of years old. It behaves as a temple as the stones alignment and the choice of the type of stone will help magnify and amplify the already existing energy there. Famous temples in Meso-America such as Chichen Itza in the Yucatan or Teotihuacan north of Mexico City were evolutions of these concepts. Important to note that these demonstrated design principles which represented the existence of masculine and feminine forces , the sun and the moon, the yin and yang presence which is commonly referred to in Feng Shui. The pre-maya temple of Teotihuacan in north of Mexico City. Much later, it was found that many ancient sacred pagan sites were destroyed with cathedrals and churches built on top of them. One of the most important examples of this is Chartres Cathedral. Built in the middle ages, not only was it built over an ancient Pagan site which could have been built there any time between 10000 and 2000 BC, but it used ancient principles in its creation. Vastu Shastra was a process which was created by Hindu monks during the Vedic times, approximately 7000 years old. It was used first to build temples and sacred buildings but then became a practise to create private homes as well. This practise was then carried over to Himalayas to China where it was adapted to become Feng Shui 4000 years ago. Both Feng Shui and Vastu Shastra are based on the same principles as the ancient temples which were discussed before. This is why, at its core, Feng Shui is about Qi energy, the yin, yang masculine and feminine, and alignment to the forces of nature. Today, Feng Shui is the foremost form of sacred space practise. However many practitioners are now branching out and seeking new ways of building spaces which use a mix of different practises which expand beyond this lineage. The principles which were derived from the path described above are the foundation of the sacred space practise. But one of the most important components is the human key component. This is all about the relationship of the owner with its home, and how this balance or imbalance affects the sacred nature of the space in a powerful way. This is the more psychological aspect of this work. The story of the temple of Solomon depicts its protagonist as a fabulously wise king and prophet, famous builder of the very first temple of Israel. He later became known as the "king who sinned" as he began to demonstrate "bad habits" inherited from his father, King David, such as idolatry, marrying foreign women and straying from God. The temple soon began to fall out of balance and after his death it was disastrously ransacked by the armies of Assyria and Egypt, leading to the historical split of the land of Israel. According to ancient records, as long as the temple was maintained, the world was full of blessings for its inhabitants. But ever since it fell into disuse and misuse "there had been no day without a curse". The stories of Solomon and Uzziah are not isolated ones. It was common in ancient civilisations to believe that major catastrophes (IE: drought, floods, or plagues) were a sign the temple had fallen out of order, and that its King was out of alignment with the cosmic forces. Whilst today, most of us are not kings or queens, and floods and plagues are not as prevalent as they were... the fundamental lesson still stands: for our homes to be in harmony we need to be in harmony first. Modern Feng Shui practitioners agree. While this 4000 year old "art of influencing our lives through space" tends to be quite systemic and prescriptive, the newer generations of practitioners believe that it is, first and foremost, a journey of personal growth. Furthermore, whilst most of us believe we have chosen our home of free will, that is only half the story. It has, in fact, chosen us as well. Our homes being composed of water and energy (as we are) they carry issues, stories, emotions just as we do. As they mirror us, their reflection becomes an invitation to personal growth and when our internal dialog is demonstrated in a physical environment around us, we have nowhere to hide. Facing these demons and shedding light to the darkness paves the way to a fuller life, living closer to our true self. By turning our home into a balanced and harmonious temple of light, we become one as well. From this place, we find connection to inner peace, self love and a path of purpose, enabling joy, abundance and a sense of deep connection.